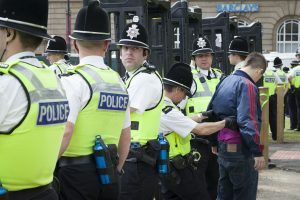 The police practice of stop and search in Scotland was at one time being conducted at a rate about seven times higher than that of the London Metropolitan Police. It was unaccountable, largely unrecorded and mostly ‘ignored’ by political leaders and the media. That all changed with findings from PhD research in Edinburgh in 2014. Since then, Police Scotland and the academic community have travelled a long, and at times, very bumpy journey of consultation, evaluation, reform and governance. Once the model of what ‘not’ to do in times of challenge, Police Scotland now actively engage with others to develop policy and practice from a stronger evidence base and can serve as a model to other police forces in this regard. Join Dr Megan O’Neill as she discusses her role in the stop and search journey in Scotland and explores how researchers can actually change our daily lives. Everyone is welcome. This event is free and non-bookable. Places are limited so please arrive early to avoid disappointment. Doors open at 5pm. Many observers of Russian politics have been perplexed by the high levels of popular support which President Putin has been able to command. This is despite the fact the he has centralised power in the Kremlin, reduced the powers of the parliament and the opposition, and led an assault on democratic freedoms and civil liberties. 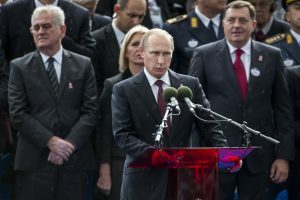 This talk will discuss the sources of support and opposition to Putin’s regime and assess the possible dangers that lie ahead during Putin’s fourth term in office. playing video games in our childhood, and continue to be video games fans to this day. The sights, sounds, and styles of classic games such as Space Invaders, Super Mario Bros. or Doom have impacted on everything from graphic design and fashion to music and film. But perhaps fewer of us have considered the extent to which video games engage more widely with collective and cultural memory. 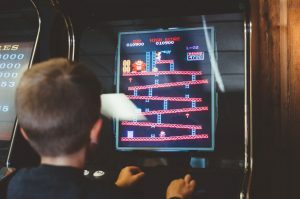 In this talk, Dr Robin Sloan from Abertay University will discuss “nostalgia games” – video games that generate great appeal through their referencing of past games, films, music, technology, and shared memories of days gone by. The teenage author of Frankenstein, Mary Shelley, was an avid reader, as her detailed diaries reveal. But her most iconic creations, Victor Frankenstein and his Monster, are fatally corrupted by their own exposure to books. 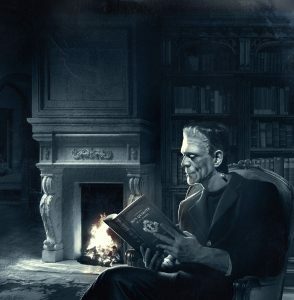 Frankenstein immerses himself in the occult sciences, while the Monster turns evil after learning about humanity’s misdeeds in Paradise Lost, The Sorrows of Young Werther, and the Bible, among other things. This talk, by Dr Daniel Cook from the University of Dundee, traces Shelley’s reading habits before and during the composition of her Gothic masterpiece, and considers the devilish role played by books in her most famous work of fiction. This summer has seen the streets of Dundee populated by a waddle of colourful penguin sculptures commissioned by Maggie’s Dundee, a charity that supports people and families affected by cancer. The penguin sculpture was designed by Janice Aitken and each one has been decorated with individual designs by a wonderful range of artists and designers. The finale of this fantastic venture is the auction in September, making the penguin parade both an excellent fundraising initiative and a fantastic awareness raising project for the charity. The trail has been enjoyed by adults and children of all ages, ‘collecting’ penguins through taking photographs and updating specially designed sticker albums, and getting out and about on foot, by bus and on their bikes. 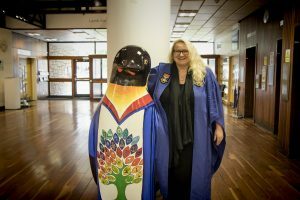 Join Janice Aitken from the University of Dundee as she discusses the Maggie’s Penguin Parade and some of the other public art pieces that she has created, including the boards recently on display at Slessor Gardens and the decorative windows for the Medical Library at Ninewells. There will be a collection in aid of Maggie’s at the end of the event. Each year, Duncan of Jordanstone College of Art & Design is transformed into Scotland’s largest exhibition space. 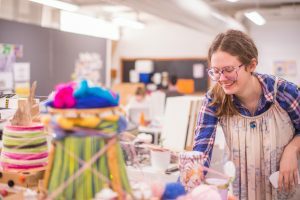 The 10 day event showcases the work of over 350 of the University of Dundee’s graduating art, design and architecture students. At the Degree Show, thousands of visitors see the products of years of creativity and hard work in an exciting show spanning the areas of design and craft, contemporary art practice, social digital, graphic communication and architecture. Join us on Tuesday 8 May 2018, 6pm at The McManus: Dundee’s Art Gallery and Museum, for a sneak peek at what this year’s University of Dundee Art, Design & Architecture Degree show has to offer. Students from a variety of disciplines will take to the floor to discuss their work, in advance of the show opening on Friday 18 May 2018. Social work and social workers are often in the hot seat. They work in the uneasy spaces between participation, responsibility and risk, big ideas that don’t always get along. 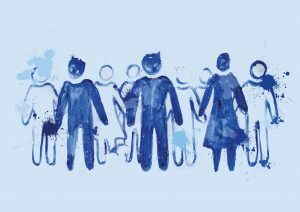 Recent policy talk says that the public and service users must be more involved. But is that what we want? And what does it means for social work services and the people who use them? 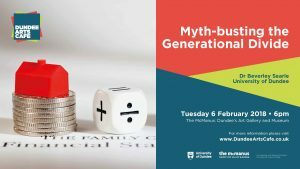 Join Dr Trish McCulloch from the University of Dundee as she discusses these ideas drawing on two different research projects with young people and people who offend. The idea of a generational divide, where one generation is pitched against another, has emerged once again in the press and policy discussions. A popular argument is that Baby Boomers, who have benefited most from public welfare and economic prosperity, should now be giving some of their gains back to help younger generations, particularly Millennials. But is this generational divide a reality or a political smoke screen that emerges during times of economic hardship? Join Dr Beverley Searle from the University of Dundee as she discusses an overview of these topics and her latest research. A memorial with the names and ages of 334 civilian drone casualties from Pakistan written on the surface of the constructed drone (written in English and Urdu). Artist and activist, Prof Joseph DeLappe, likes making trouble. 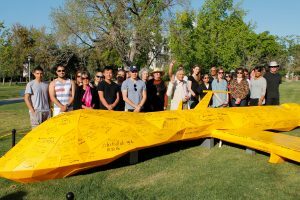 From hacking drones to selling despotic dictators on eBay, nothing is off limits, as he uses his over 30 years’ experience in online gaming and sculpture to create projects that react to modern politics and warfare. In his most well-known work, Joseph infiltrated the US Army recruitment game, “America’s Army’ and created memorials to US soldiers who had lost their lives in the most recent Iraq War. Recently hired as the Professor of Games and Tactical Media at Abertay University, Joseph will discuss his past and future work, and provide a short history of political activism through computer games, art and design. What makes a tourist destination attractive? Can (and should) famous people make a destination more desirable? This event explores the connections between celebrity and tourism through a discussion of Usain Bolt, the world’s most successful and recognisable athlete. Dr Susan Mains, University of Dundee, will discuss her research on the promotion of Bolt as a global brand and ambassador for Jamaican tourism, and in doing so seeks to address the questions: can celebrity boost tourism, how do we “sell” place and what might this mean for tourism in Dundee? You can contact us by phone on 01382 386660 or by e-mail at dundeeartscafe@dundee.ac.uk. Missed an event? You can catch most of them here. If you want to know more about public events based on the world-leading arts practice and research in Dundee you can follow Revealing Research on twitter.